We all love the story of the prince who is cursed to be a ’beast’ until he learns to love. 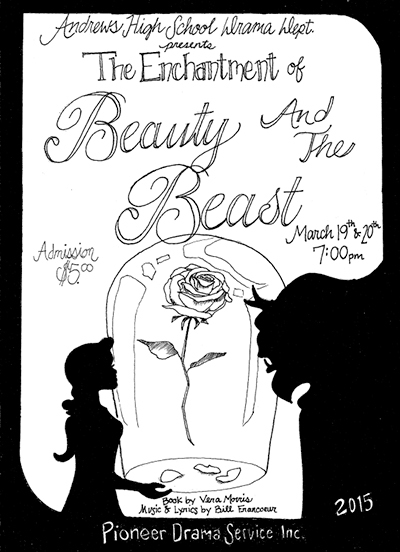 In this enchanting version, you’ll find loads of female roles, starting with a poor widowed woman who plucks a forbidden rose from the Beast’s property. Though he sentences the woman to death, Beast allows her to first say good-bye to her family. At the widow’s farm, we meet her two distasteful daughters and greedy sons-in-law. The four of them hear her ’insane’ story and don’t believe her. But her third daughter, Beauty, goes to the Beast and promises to stay if her mother’s life is spared. Of course, Beast falls in love with Beauty, but can he change enough for Beauty to ever love him? Read more...Unfortunately, the two sons-in-law slink into the eerie castle hoping to filch a treasure. In a hilarious and thrilling scene, not only is there a battle with the Beast, but also with the enchanted clock, chair, and masterpiece painting! One of Pioneer’s top-selling children’s musicals, your audience will be touched by both the script and the score, filled with nine dazzling musical numbers. What's So Special About This Girl? Could You Possibly Be My Friend?